When you visit the Cedar Knoll Hunting Lodge, our team works hard to make sure your experience is as near perfect as is possible. From providing you with great food options to making sure you are in the best position to meet your goals while in the heart of the nation’s best deer country, we are confident that your South Carolina deer hunting trip will be fantastic. 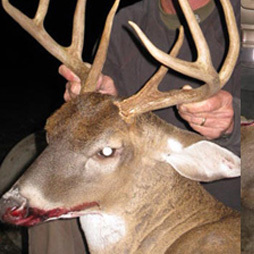 A typical deer hunting trip features a wakeup call one hour before daylight. During this time, you will be given the opportunity to prepare for the hunt and eat a continental breakfast. We then take you out to our elevated stands, tower blinds, or ground blinds for about three hours. After that, we offer brunch and a wide variety of activities. Afterwards, the afternoon hunt is held for three hours and we serve you a large dinner. Please note that, when hunting with us, you will need to bring rifles of a minimum .243 caliber that should be topped with modern, light gathering scopes. These scopes should be zeroed at 100 to 200 yards for a successful experience. It is our duty to make your South Carolina deer hunting experience perfect, so contact us today to book a trip for you and your friends. Our lodge caters to hunters along the I-95 corridor, including Florida, North Carolina, Virginia, Maryland, Pennsylvania, Massachusetts, New York, New Jersey and Vermont. This entry was posted in Uncategorized and tagged South Carolina deer hunting on July 7, 2016 by 15803827. Hunting is a thrilling adventure and there is no place better than the Cedar Knoll Hunting Lodge in Fairfax, South Carolina. For more than 25 years, hunters from around the world have come to our lodge to hunt deer, wild boar, turkey, and quail. Located in the beautiful South Carolina Lowcountry, this lodge is the perfect place for hunters of all experience levels. When you come to Cedar Knoll, you’ll be able to work with guides that will put you in the best position to hunt wild hogs and deer. All you have to do is round up a group of your hunting friends and come experience the best Southern hunting scenario in the country. When you visit our lodge, you’ll stay in our comfortable, fully-furnished facilities and enjoy amazing meals that will make you wonder why you have not visited Cedar Knoll Hunting Lodge before. You can rest assured there is no doubt you will have an exceptional trip, as because the staff at our lodge is one of the nation’s leaders when it comes to white-tailed deer and wild boar hunting techniques. Don’t wait to plan your next trip! Contact the team at our hunting lodge in Fairfax, South Carolina, to book your stay today. This entry was posted in Uncategorized and tagged hunting lodge south carolina on July 7, 2016 by 15803827.